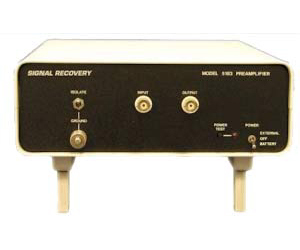 The model 5183 is a high input impedance, AC coupled voltage preamplifier which features a very low noise input stage. It has a frequency response from 0.5 Hz to 1 MHz and a fixed gain of x1000 (60 dB) and incorporates a special pseudo-differential input stage that can be floated to give the ground loop immunity normally associated with differential inputs but without the associated noise penalty. It can be powered from its own internally housed (alkaline) batteries, an external low voltage supply (±15 V or ±18 V) or from the model PS0108 remote line power supply (optional extra). This preamplifier can also be powered from most of our range of lock-in amplifiers and from the model 7310 noise rejecting voltmeter The model 5183 is ideally suited for amplifying signals from high impedance cryogenic sources, capacitance transducers and IR detectors such as Ge, Si, PbS, PbSe and InGaAs.